A to Z of Wildlife: U is for… Uakari Monkey! These funny looking monkeys live in South America in the forests and around marshes and lakes. They are easy to spot as they have orange fur and bright pink heads. The the brighter pink the head the healthier the monkey! Uakaris live in groups of 10-20 but some groups have as many as 100 monkeys. Unlike most monkeys, Uakaris have very short tails, but move nimbly in the trees without them by using their arms and legs. Uakaris forage during the day. They eat a fruit-heavy diet, but also consume leaves and some insects. Their powerful jaws can open a hardy Brazil nut. Most food is gathered in the trees, though during dry periods when food is scarce, uakaris will go to the ground in search of fallen seeds or roots. Check out this video below to see some Uakari Monkey fly through trees! Wild Challenge! 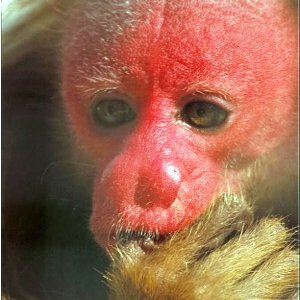 Why not find out more about Uakari Monkeys?